It's all so romantic walking down the centre of the garden, grapes hanging in luscious clusters on each side. It's still romantic as you take big baskets and extra large mixing bowls and start filling them with cluster after cluster of grapes dreaming of all that wonderful, healthy and free grape juice you'll be storing in your freezer. And that's where the romanticism comes to an abrupt halt. You've been standing at the counter for 3 hours, washing, juicing, squeezing pulp in cheesecloth and bottling grape juice, your hands turned purple, the floor littered with tiny purple stains and a bucket full of stems at the centre of a cloud of fruit flies and your back aching. That's when you ask yourself why you decided to do this! Okay, I will admit, after day two of juicing and squeezing I was hoping I'd never see another grape. But it's a little like giving birth. During the birthing process when you are screaming through the most excruciating pain ever, you probably wonder what possessed you to decide to get pregnant. But later when all is healed and the pain is forgotten, gazing into that adorable little face, the agony you went through to get to this point seems to fade a little. And so it is with my grapes. I was nursing my aching back, staring at the mess in the kitchen and wondering what possessed me and vowing no way I'm doing this next year. Now that the kitchen is long since cleaned up and we are enjoying the fruits of our labors, it doesn't seem as though it was so bad. Yes, we'll do this again next year. 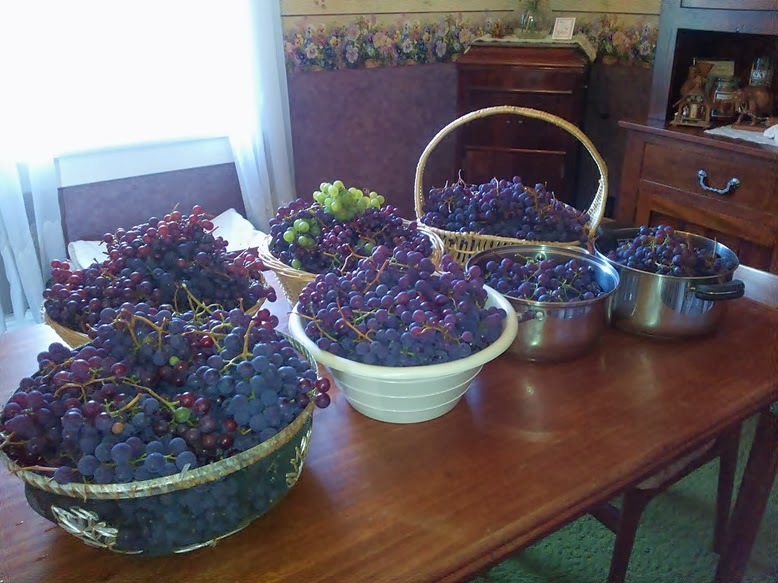 This is about 1/2 of the harvest. Todd got to work on the old wooden workshop these past two weekends. Up until now it was just a lot of storage for tools and such but wasn't really useful otherwise. The old fuse box has been reconnected with new wiring and a new 220v plug installed so that he can use his air compressor and welder. This came in handy when he did some work on the old Jeep Cherokee we recently picked up. It's a far cry from the large, heated, wired garage he used to have but at least he can do a little work here and there to fix this and that. Guys have to have their hobbies, you know! We are still visiting the beach though now it's with coats and warm shoes. It's still wonderfully soothing to stand on the shore, cold wind or not, and hear the waves rolling in. Todd's sister and her husband came to visit and as we were all walking the beach we picked up some pretty big shells. 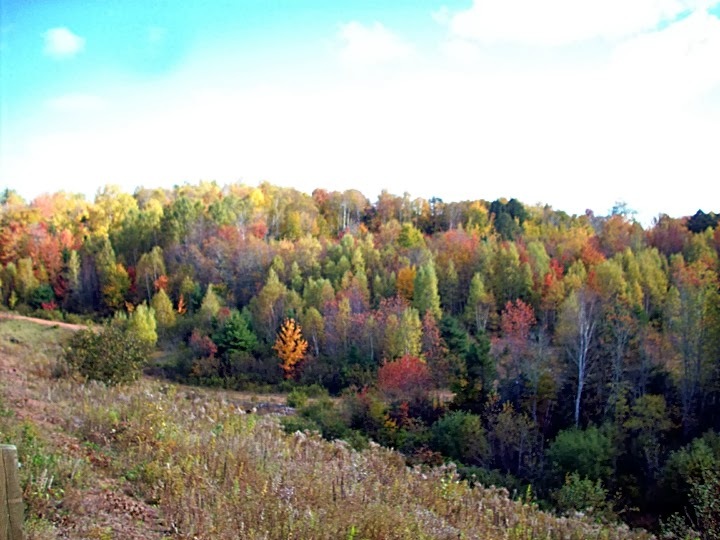 The fall colours are so beautiful here, it just takes your breath away. 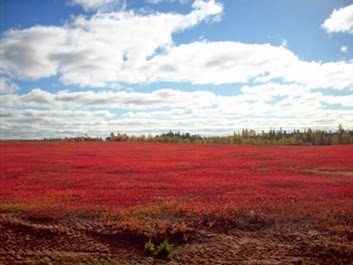 The trees are turning to colours of orange and gold but nothing is so vivid as the blueberry fields turning red. I sometimes find myself wishing I had a really good camera so that I could take pictures that would really do justice to the beauty here. The kitties have been having a difficult time with the reduction in freedom outside here. We have erected a small cat corral with wire fencing, but I don't often have time to get them out there because I have to sit with them and keep an eye out for eagles who might want to swoop down and take one of them off for lunch. So until we build our enclosed cat run, this will have to do. Poncho is always trying to climb out but Taz is usually very well behaved. Which is why I was totally off guard the day I opened the gate to get them in and she dashed out at top speed. I was so focused on the terror that she might dash into the woods and I'd never find her that I didn't prevent Poncho from dashing out after her. My heart was in my throat and as Poncho was heading for the woods and Taz was hiding under the apple tree, I went after Poncho first. Got him inside...*phew* and went back to get Taz. 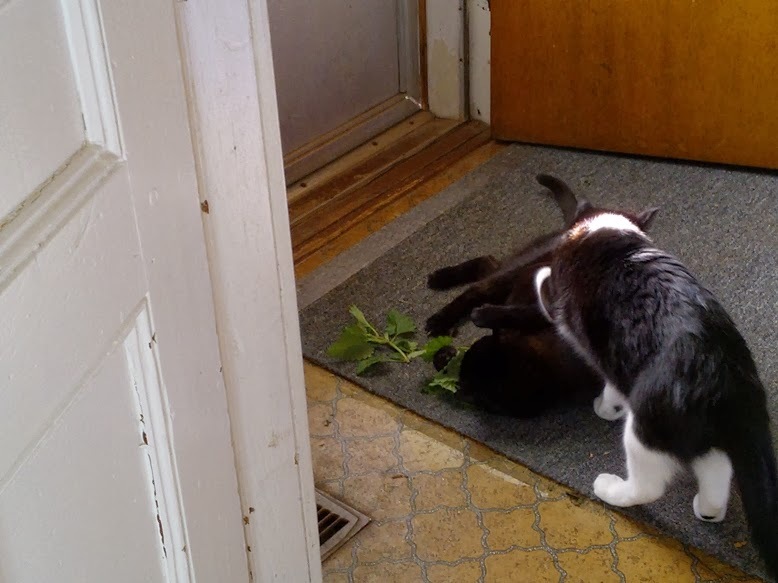 I wasn't too sure why I was having trouble coaxing her out until I spotted it...those familiar little green leaves...she found Catnip! So that's what she was after! Needless to say, we had to pluck some stems and bring them in. As the cold winds start to blow, nature is trying to move in and share this warm space with us. The sound of pitter patter in the roof over our bed, and the sounds of nibbling on the inside of walls is a clear indicator. But when you can hear them rolling acorns or something across the floor to a corner you know they are settling in for the long term! Off to the hardware store for traps! Thankfully the sun is still shining brightly most days, even though the winds are cooler now. It means we still have a little time left to finish some of the jobs outside. The grapevines now need to be pruned and restrung on the wires where they've fallen down. The area we uncovered for vegetable planting next year needs to be tilled and turned over so that it's ready for next year. Weatherstripping to install, windows to insulate, and there is still a lot of cleaning and organizing to be done in the workshop, garage and basement where stuff was unceremoniously dumped during the move. Garden tools and riding mower need to be prepped for the winter rest. Markers need to be installed at the end of the driveway so that we don't drive off the edge into the ditch come winter, when the snows hide all the visual cues. I already replaced the broken flag on our mailbox with a homemade version crafted out of a dish detergent bottle and some read electrical tape. Once the winter snows begin to fly we'll be working on some of the inside jobs like pulling up carpet, pulling down wallpaper, plastering and painting and doing all sorts of little things to spruce things up a bit. We are so excited at the prospect of cutting down a Christmas tree from our own property this year. We haven't picked one out yet but there are lots to choose from. We've now been officially moved in for 5 months and there is still so much new stuff to see and experience. The weekends just seem way too short and we missed out on some of the local festivals and events. We have yet to experience a Ceiladh (pronounced kay-lee), a lobster supper or an evening of entertainment at the Olde Belle Church around the corner. Next year I guess. I think it will take some time before we are settled in enough to feel completely at home. Hopefully we'll soon have a small guest cottage for all the visitors we are expecting to have in the next couple of years.